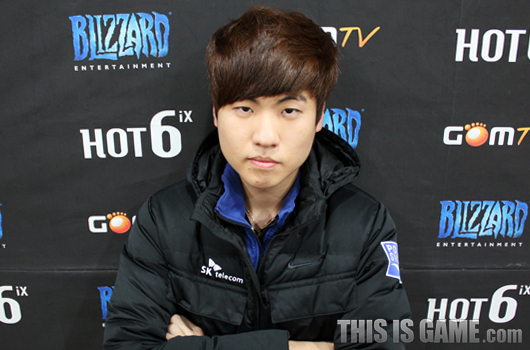 You finished off your GSL debut with a victory. How do you feel? I've lost all the feeling in my body right now. I am so happy (laughs). A lot of players have stated that the MokDong studio is comfortable. What about you? This was my first match so when I went in for my very first attack my heart was jumping so much and I was nervous. I messed up in both games one and two but it wasn't bad enough to throw the match away so I was able to win. After you won, you were caught on camera looking really happy. I normally don't even use a barcode ID on b.net. So I was really worried since everything was on display for all to see and my opponent was IEM's champion First so I was expecting a difficult match. But I figured that I would do really well as long as I won the first game and lo and behold, I hit the mark (laughs). Both games you did not secure your natural and just went for pure aggression. That strategy is something that I normally always use on ladder. Since I use it so often I was a little uneasy but I knew that it was a difficult strategy to block even if the opponent does know about it so I decided to go for it. From First's perspective, I'm sure he could have countered it but I played safely and made sure my build order didn't get crossed over so I was able to win without much difficulty. Your next opponent will be HyuN. He is also a really difficult opponent but do you feel confident? In TvZs, it's really hard to go for an early game all in. But that doesn't mean that I'm just going to pathetically admit defeat so I plan to prepare for long macro games. Since I won today and secured my spot for next season's Code A, I am going to do my best and try to go all the way to Code S. If I can overcome a huge obstacle like HyuN, then I think I will be perfectly capable of pulling it off. Next season and onward will be HotS. Are you preparing for it? For now, I'm focusing on WoL. I don't think it'll be too late for me even if I do start preparing once this season ends. I want to thank PartinG for helping me with practice with me even though he had Proleague yesterday, KimDongKyoon, and AZUBU's Genius. Lastly, I want to thank my teammates for cheering me on as they told me to do my best. First off, congratulations on your victory. Tell us how you feel. I feel really happy. I was nervous since I was meeting a rookie but I am relieved that I won and I will beat my next opponent and work hard so that I can advance to Code S.
How did you prepare for your match against a rookie? I told myself to play safely and try to do things well. I figured he would try to force an engagement out of me during the mid game so I focused only on that aspect. Were you prepared for the new maps? I hadn't prepared for the new maps yet. I just practiced on whatever maps were scheduled for my match. If I have to play on the new maps, then that's when I'll start preparing for them. Your next opponent will be Ryung. What kind of match do you think it will be? Personally I think Ryung is one of the best TvTers out there. But I don't think I fall behind him so I am going to prepare well so that I can win against him no matter what. Your personal best is the second round of Code A. This season's goals? Of course, Code S is my goal. For now, getting to Code S will be sufficient enough. I kept on getting eliminated in the Up/Downs but it's not because I had a lot of losses, it was because I lost in the head to head scores. This time, I am going to work hard so that I can make it up there no matter what. Is it difficult to juggle both GSL and Proleague? Honestly, yes. 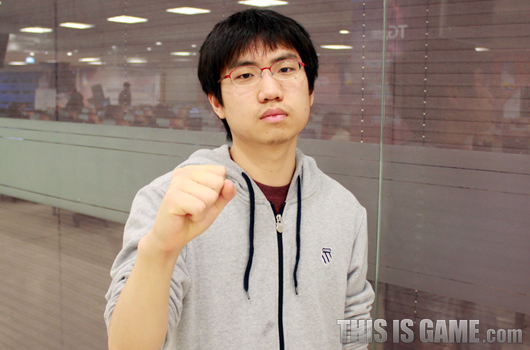 KeSPA teams have no choice but to give it their all for Proleague. The only times you have to practice for GSL is like the day before your match or something like that. But I prepare for GSL by preparing like I would for Proleague so I think it's doable. A lot of people criticized your style in the past but these days it seems like you only have like 1 - 2 differences of scv numbers. Back in the BW days, I even had weeks where I would have to play a total of fifteen official matches. I think it was during that time where I was able to develop a kind of personal know how. Being able to overcome those kinds of obstacles even though I'm busy is a special know how of mine. People are saying that your macro is flawless as always but your micro still has yet to get there. I also feel this way. You could call this an excuse but I feel like my bio micro for televised matches is worse than during practices. It's really strange as to why this happens but I am trying to fix it. I hope that everyone will enjoy their Chinese New Year break. Tell us how you feel about advancing to the second round of Code A. The first match of the new season was a TvT so I was really nervous but I was able to win like this so I am happy. Your opponent, Dream, had recently grabbed a second place spot in a overseas tournament so what were you thinking? Originally I was supposed to attend but there was an age limit so Dream was sent in my place (laughs). I just told myself that it was what it was. This is the final WoL season so it was difficult to find practice partners. Aside from my teammates who are still in the GSL, everyone else was preparing for HotS so I had to practice through ladder. Your next opponent is Sniper. I'm expecting a difficult match. It's going to be difficult enough as it is since it's a TvZ. What is most difficult in TvZ? It's just difficult (laughs). This next match is going to be my biggest obstacle. You secured your spot for next season's Code A. Are you preparing for next season's HotS transition? Whenever I'm on break, I practice HotS. I think it's okay. But even HotS TvZ is not easy (laughs). I want to thank the Terran player who helped me with practice. Thanks to today's scheduled match, I wasn't able to go see my family for the new year's. I just want to hurry up and see my parents. Lastly, I want to wish ByuN hyung good luck on his match later on today. You advanced to the second round of Code A. Tell us how you feel. I'm not really feeling anything right at this moment. I am glad that I don't have to go through the preliminaries again but I don't think I'll be truly happy until I get to Code S.
You won game one with a fast stalker build. It was originally supposed to be a defensive build order but my opponent didn't att attack me. I figured I was going to lose if I didn't move out right then and there. I lost in the build order battle but I won in the micro battle. You went for an immortal all in for game two. Happy probably would have blocked that had he made marauders. Originally, that build order was supposed to get blocked and the chances of me succeeding were really low. I lost probes to his hellions so the situation required me to force a victor to come out. Before the battle began, I think the biggest factor as to why I won was because I stopped stim pack from finishing. Which is why everything was doable since all I had to do was keep stacking up my units and force engagements since he had no stim pack. 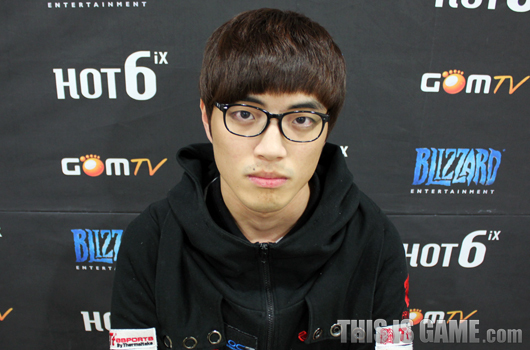 You will face the winner of Mvp vs soO. Who would you like to face? I would prefer to face a Zerg player. Ever since the nerf, facing Zerg opponents have become comfortable. How are you spending your time at the MVP team house? While it's true that I am the oldest hyung and the team's captain, I fall behind in terms of skill to the other players. I am working really hard right now because I feel like I have a duty as the team's captain to start making results. While I feel like it's a little late, I still want to become a proper team captain. The dongsaengs also follow me really well. You also have to prepare for HotS. If you really look at it, it's a brand new game. If a player wants to make it up fast through a new game, then the amount of practice as opposed to raw talent is most important. It's important to find a lot of things out about the game for yourself and then turn those things into your own advantages so practicing is most important. You must be concerned about your age. Do you have a military deadline coming up? I am concerned. It's a huge issue and it's not something I can just view as a light problem and every second counts right now. I've been a pro gamer for a while now but I have almost no results to show for it. I think I'm going to be really disappointed in myself if I just end up going to the military like this. I'm going to do all I can and obtain a certain status so that I can at least gain some recognition even after coming back from the military. So then what are your goals? I want to win a HotS championship. I can't help but think that that could be a turning point in my life (laughs). I hope that everyone who reads this interview will have a great Chinese New Year break. I want to thank my Terran teammates for helping me with practice. Today, five of the MVP dongsaengs graduated from high school. Now that they're adults, I really hope they start acting like one (laughs). Lastly, I want to thank our sponsors Lotte Chilsung, Razer, and partner Wayi Spiders. Tell us how you feel about grabbing the victory. After going to an event in Taiwan, I returned to Korea last night. So I thought I was going to get eliminated but I feel so good cause I won. So you weren't able to practice because of the event in Taiwan? That's correct. I was gone for 5 - 6 days. Is that why you went for all ins mostly? Honestly, I had a strategy all prepared for game two. But then the head coach advised me to grab the victory by throwing in an 11-11 since I always do macro game games. I normally play long macro games but this time I wanted to end it early so I improvised and went for the 11-11. You will face the winner of Center vs Seed. Who would you like to face? Last season was the same situation as this season. I wanted Seed to make it but Center made it up and I ended up losing. So I want Seed to come up this time as well. With today's victory, you secured your spot for next season's Code A. But you also have to prepare for HotS. I really haven't played much of HotS. I still have WoL games so after all those are all done and over with, that's when I'll really start on HotS. No matter how high I make it up, I always end right as Code S. As far as I can tell, I probably can't get past here. I've thought about it a lot but I think with my skills right now, I'll probably end up having to go through the Up/Downs through a difficult path. You must be contemplating heavily about how you're going to increase your skills. I do really well during practice. I just get nervous for televised matches. I'm not sure if I'll grab the championship but I think that with my skills I can go to the Ro8 of Code S. I don't know if it's because I get nervous or what but I keep losing so I've lost a lot of confidence. You are a player from the Open seasons but you still get nervous? I've played about 100 televised matches but I don't know why I keep getting nervous. 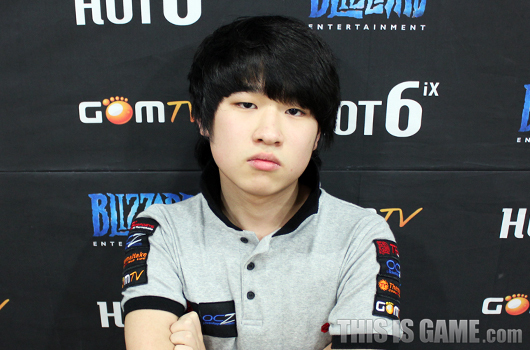 I think I've developed a kind of trauma ever since the 2011 GSL July Code S match against LosirA where he all ined me. Also, the curtains in the booth always sounds likes something's coming at me. I feel like the audience shouts every time I go in for an attack so that kind of feeling makes me anxious. Anything else you woiuld like to say? I hope everyone will spend a nice Chinese New Year break. I dedicate my victory today to ClassicPrime. And the reason I was able to win had a lot to do with MarineKing. I want to let him know that I am grateful. I went away for 5 - 6 days and the people over there treated me so well. I was so grateful for that. You must have been surprised after seeing who you were up against. I was confident but the maps were difficult. I had almost no knowledge of Icarus. I was planning on going for an 11-11. I had a lot of thoughts going on the day before the match and then I woke up early in the morning. That's when I decided not to use an 11-11 and go for a real game while sticking to the basics. Using your scvs, you changed the flow of the game. Utilizing my scvs is 100% improvisation. I'm sure everyone plays TvP through their own way. Personally, I feel like if I attack with my scvs then people then I grab a timing that people can't block. Game two I played through a feeling and game three I hit a timing attack. Your next opponent will be ByuN. Are you confident enough to win again like last season? ByuN has Terrans he can train against on his team but I'm part of an overseas team so it's so difficult to find practice partners. There are so many players that are preparing for HotS. I'm going to have to try to win by using the basics. You recently just joined a new team in Quantic. When we were first in negotiations, the terms did not meet up. But HyuN hyung emphasized that I was necessary to the team so we were able to come to terms. How's your life like these days? If I didn't have anymore GSL games then I could probably go live in America. My team will back me up in whatever decision I take so it's just up to me at this point. I had to go a really long way this morning to get to the studio. When I think about having to go back home after this, it hurts my head. So far, I've only been concerned about the games that are ahead of me so I don't know what's in store for my life at this point. With today's victory, you secured your spot for next season's Code A. How confident are you for this season? I stated last season that I was going to go to Code S but then I ended up failing so I don't think I can carelessly say things like that anymore. But there is something I would like to say. I received a lot of criticisms saying that I don't know how to split my marines. To clarify my story, whenever banelings come my way I am always looking at the screen. I think people who have played on maps like Abyssal City and alike will understand what I am talking about but there are a lot of instances where frames will drop. So I would end up losing my matches because I couldn't split. I think I'll be facing Terrans or Protosses up till the third round of Code A but I think I can make it up to code S as long as I work hard. For seom reason, I do tend to play really well once I start off with a loss in game one. Looks like I need to develop my own know how from now on so that I can do well from the very get go. I want to thank Venus hyung, Cyrano hyung, and Brown for helping me with practice. While I was trying to find a team, SeoHyeon hyung helped me out a lot. I want to take this moment to thank him. I also want to thank HyuN hyung for coming to the studio to cheer me on. Shine has his match ahead of him so I hope he does well. Lastly, I am sorry once again to Seed and I really hope we don't meet each other next time. 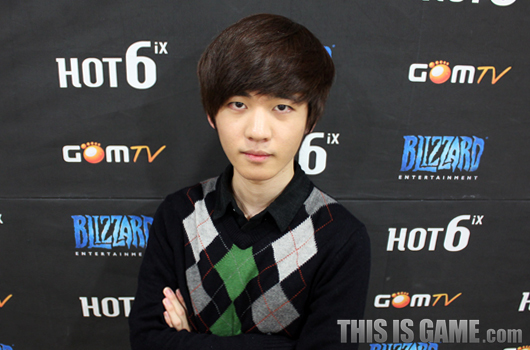 During the last GSL, I got eliminated from the first round of Code A. But I'm so glad this season since I was able to get through the first round. I'm normally good friends with ByuL so I do also feel sorry that the match had to end this quickly. You won game one pretty easily with fast zerglings. It felt like ByuL had a lot of preparations done for something. I saw what map game one was going to be on and decided that it would be good to use speed lings. I started off my build order exactly along with ByuL's but I felt like I was going to win if I made more zerglings and pressured him and then later on my victory was secured as our build orders got crossed over. Game two ended in a hurry. We were able to scout each other so I expected ByuL to try to take his natural. But then ByuL ended up playing the way that I wanted him to so this kind of result came out. It was a shame. I think it ended too anti-climatically. Your next opponent will be Lure. Are you confident? I'm sorry to Lure for saying thing but I was expecting Jaedong to make it up. This was an unexpected result. But since he was a player that was able to take down Jaedong, I'm not going to let my guard down and prepare extensively for him. I think it's probably difficult for all KeSPA players. But you always make good results if you work hard so because of that, it's easy to just keep working hard and prepare. You secured your spot for next season's Code A. This season's goals? In my opinion, the bigger the goals I make for myself, the better it is. I have yet to step foot on the Code S stage so advancing to Code S will be my goal. If I do make it up to Code S, then that's when I'll start thinking about my next goal. Was it difficult to prepare for maps that aren't being used in Proleague? I was kind of worried since there were two maps that Proleague doesn't use. But since the match against ByuL was a mirror match, I was still able to fully prepare for him even though I didn't have that much time. First off, tell us how you feel about winning. I was able to beat a really famous player in the world of SC2 so I feel honored and glad. 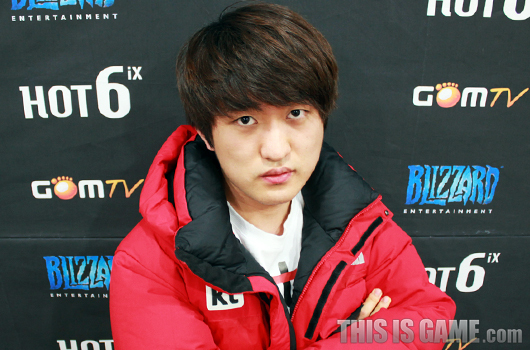 Your opponent was Mvp who currently has the most GSL wins. I didn't have a lot of time to prepare. I couldn't practice a lot because of Proleague so I just thought a lot about the game. I think I was able to win because of that. You blocked his hellion pressure early on in game one but then went on to take way too much damage. He's played for a long time so he really does know how to poke someone and how to win. So I told myself that I would be able to win as long as I had brood lords by the time he went in to attack. You prepared roaches for game two. Was this influenced by NesTea's match? When I went to MLG, EG-TL's head coach, Hwanni, taught me that strategy. I took that strategy and changed things around so that it would fit me the best. I did feel a little uneasy since Mvp attacked me first but overall, I think things went well. Your next opponent will be Killer. What kind of match are you expecting? I wasn't able to watch Killer play when he was in his prime. I wasn't able to dissect his skills I think it will be a little difficult but I plan on having a fun match with him. The GOMtv booth is so good. The YongSan studio is kind of small. The GSL booth was able to give me the comfort and the room I desired so I felt like the space was all mine. The next GSL season and Proleague round four and onward will commence as HotS. How do you plan on preparing for them? I still haven't played a lot of HotS yet. But I've heard about it and people say that Zerg is not that much different. So I think I'll be fine when the time comes to transition to HotS. I just have to make sure I can always react to my opponents. A lot of people are worried about Bisu hyung these days. He's doing well so I hope the fans don't worry too much. FanTaSy hyung is currently on a losing streak but I believe he's going to start doing well real soon. I want to thank FanTaSy hyung for helping me with practice and thank Hyuk hyung for always coming with me to the studio and taking care of me. Oh, Seeker... Putting interviews in a tournament section. Does LabyRinth not know that PartinG can't play until the 4th round in PL? 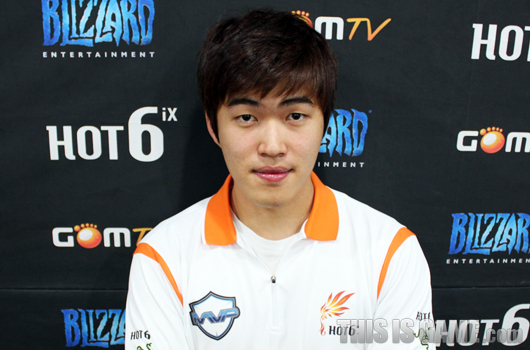 LabyRinth 2013 GSL Season 2 champion? Obviously LabyRinth does allins vs P every game. It's a pity First didn't know about that I'm sure Hyun will be able to crush him. 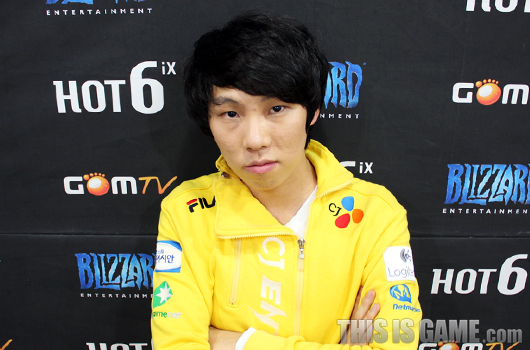 Flash look so unimpressed :D Hope he gets to code S this season. Lol that GIF of Labrynth. Wow. Did Killer always sound this mature in interviews? It seems he really has taken a shine to being a leader within MVP. Of course Sangho is the #1 hyung but I didn't actually think he was the oldest player on MVP, he only has 1 year on me.